A week from yesterday (aah!) I'm leaving for a long road trip with my family from Portland, Oregon to Custer, South Dakota. It's 19-23 hours' drive, depending on our route, and of course we'll make stops. We've done this basic route before, summer of 09 and summer of 06, en route to weddings and family events in Wisconsin and Indiana, but this time we won't be going nearly as far! I've found I actually enjoy road trips and don't mind being in the car for long periods of time, and I love seeing new scenery in the Great American West. But, I do get tired of the decor. How petty is this? I know, I know, but here I was last summer, a West Coast girl, in my bright yellow mod tanks and gladiator sandals, huge knockoff designer sunglasses, and fake Michael Kors quilted bag hopping out of my Oregon-plated Prius in front of souvenir antler and pelt "trading posts" and log cabin-themed rest stops. I felt like I clashed. ;). From Pendleton, Oregon east through pretty much Minnesota is all decorated this way, and this year I want to look like I match. It's not my favorite type of decor (I would prefer a posh Palm Springs pool deck or faded-shingle Puget Sound beach house), but I can work with it. I know, I know, they're not that bad, but I really want to dress appropriately this time! ;) Without looking like a cowgirl. I don't necessarily want to look like a local, but I want to match the decor. As I was thinking about style inspiration, my mom suggested I check out Sundance. Have you heard of it? It's Robert Redford's clothing and jewelry company out of mountainous Western Utah; my mom used to get the catalog, and they always had beautiful stuff with equally amazing photography and layout! The jewelry pages were always so nice, all the artisan and handmade quality jewelry on beautiful backgrounds. The clothing prices are comparable to Anthro or a little cheaper, and always high quality stuff. Check out some western-ey inspiration images from the catalog! Lots of pretty things that aren't too rodeo-rider, but still totally get the look of the beautiful country out there. I'm not sure I can afford any of them right now, but I will be looking through my closet and maybe the fabric store to see if I can capture the look myself based on these great designs. So basically I'm just thinking about how to dress and accessorize for the mountainy/western decor of the Black Hills of South Dakota, where the reunion is, without looking like a hunter. I'd love to hear your ideas! Do any of your live in the Great West? Have you been through the Yellowstone/Mt. Rushmore area recently? What other catalogs or sources should I look to for inspiration? I live in Alberta (in cowboy country) and I don't know too many women who wear cowboy boots with dresses in the summertime (as adorable as that look is).... Boots w/ jeans-yes. flip flops w/ dresses-yes. Unless you're going Stampedin' in Calgary! but that might be a Canadian western thing! I love the dress and cowby boots look, but it is not really very practical. I also like the tunics with skninny jeans and boots. I live in South Dakota and I would say that style here is 2-5yrs behind the west coast...so really the best way to truly blend in would be to where your clothes from 5 yrs ago!!! 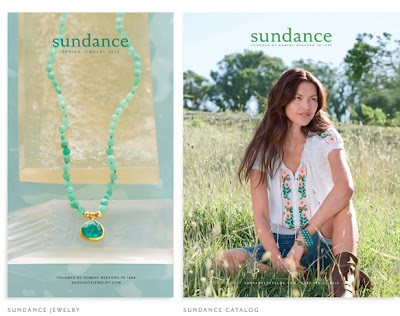 The sundance catalog is beautiful but I have never seen anybody dress like that here! Have a good trip! Hi! I'm an Oregon girl too (grew up in Eugene) but I went to college in Montana so I know your dilemma. I've never seen anyone dress exactly like those photos either and cowboy boots in the summer= smelly boots for the rest of the year. Honestly if you want to look like you belong I would get lots of loose summer dresses with flip flops. And whoever said wear clothes from a couple years ago was right. Have fun on your road trip! I love the floral dresses and the embroidered shirts! I like the look of the boots, but I gotta agree that it might not look practical. Maybe a comfy pair of laid back sandals? I don't necessarily want to blend in with the locals, more just with the scenery. I like the 60's/70's camping look idea... and it's okay that boots aren't practical, since I don't have any anyway any they're expensive. Although I do have a friend out here who rocks them with J.Crew-ey shorts and shirts! I live in northern Colorado and spend a lot of time in the Utah desert- that's where my fiance lives. The Sundance catalog is GORGEOUS. I signed up for their mailing list just so I could look at the pictures. Really most of us out here dress more simply than what's in style on the west coast. Loose dresses (as the first few people said) are a good idea, and I would add a few cute plaid skirts to wear with white or pastel blouses. Throw on a great denim jacket when it cools off at night, and you're golden. As for shoes, I would recommend comfy leather sandals or Tevas (I wear my black Teva Kayentas every single day of my life: http://www.teva.com/ProductDetailsa.aspx?g=w&categoryID=425&productID=6310&model=Kayenta). Also, please don't buy a straw cowboy hat. That's how we know who ISN'T a local. :) Have fun on your trip! I am from Wyoming and live in Idaho right now, yea the 2 years behind is true. I've been to the Sundance store in Sugarhouse/Salt Lake and they are way over price. Seem only rich Utahans buy stuff there. It's going to be hot in SD. People wear sundresses and flip flops and cut off jean shorts with cute shirts. Just wear what is comfy. I won't go totally cowboy only if you hit the rodeo.